Vail is located just 2 hours away from the Denver Airport, the most popular airport to fly into when heading to this mountain town. With over 58 million passengers flying to or passing through the Denver Airport annually, it is one of the busiest airports in the world. The trip from Denver Airport to Vail takes you west on I-70 through downtown Denver, into the foothills and up to Vail pass before the dissension into the Vail Valley. Located in the Vail Valley is the Eagle County Regional Airport, where United Airlines, American Airlines, and Delta fly daily. Just about 30 minutes from Beaver Creek, EGE is the closest airport to Beaver Creek. To get from Eagle County Airport to Beaver Creek, you’ll head east on I-70 for about 27 miles to the Avon exit, and head to the mountain from there. The Colorado Springs Airport is situated about 3 hours southeast of Vail. There are 19 nonstop destinations across the nation that Colorado Springs Airport services, as well as 5 airlines that fly in and out daily. To get from the airport to Vail, take I-25 N to Denver, then head west on I-70. We not operate shared shuttles between Vail and the Colorado Springs Airport, however, private shuttles are available. Peak 1 Express provides transportation safely and affordably from Denver International Airport (DEN) to all Vail Valley destinations. Choose Peak 1 as your Vail airport shuttle service and you’ll be opting for both comfort and style. Our fleet of Mercedes Sprinter vans provide a relaxing and pleasurable ride as the ascent begins up the Rocky Mountains to Colorado’s ultimate ski destination. And don’t forget the free wi-fi service provided on all our DEN/Vail airport shuttle trips. Peak 1 Express also offers shared shuttle service and private charters to Eagle County Regional Airport (EGE). Eagle Airport transportation serves the Vail Valley, including the towns of Vail, Avon, and Edwards as well as Vail Ski Resort and Beaver Creek Resort. Shared shuttle service runs daily. Our EGE shuttle schedule is available HERE. 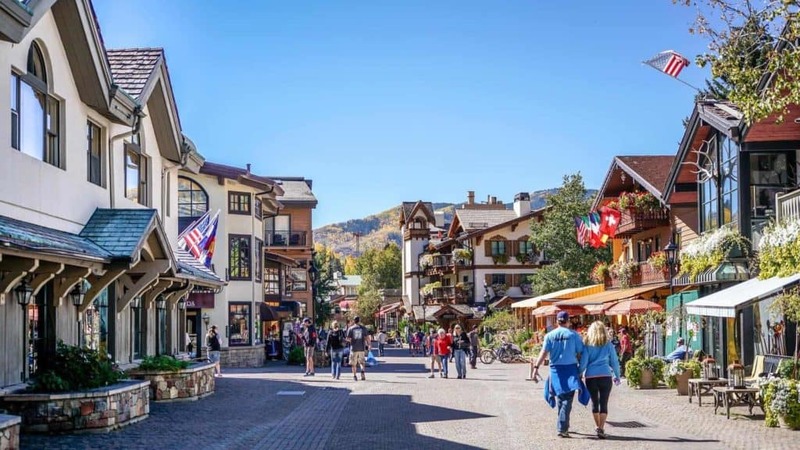 Vail, Colorado is known for expansive on-mountain terrain, including its world-renowned back bowls, a plethora of summer activities and diverse dining and shopping options year-round. When you book a Vail airport shuttle through Peak 1 Express, you’re guaranteed to save the time and hassle involved with coordinating your own transportation to and from DEN, which means more time enjoying the actual fun parts of your vacation! If you’re planning a getaway for the winter season, choosing Peak 1 Express might also mean avoiding 3+ hours of stress-filled, white-knuckle driving as you make your way up and over Vail Pass. Our winter shuttle drivers have driven the route between DEN and Vail hundreds of times, often in extreme weather conditions, and are prepared to do whatever it takes to ensure you and your group arrive safely and invigorated, ready to enjoy all that Vail Resort has to offer. World-renowned Vail, CO is conveniently located along the I-70 corridor less than two hours from downtown Denver and close to several other Rocky Mountain resorts. Accommodations range from Vacation Rentals by Owner to condo complexes to hotels of all types. Whether you are planning to vacation on a budget or seeking 5-star accommodations, there’s sure to be the perfect Vail lodging option for you. Check out some of the options below. Vail, CO and the Vail Valley are known for their world-class ski areas of Vail and Beaver Creek. You could spend weeks skiing these mountains and never ski the same run. When the snow melts and the mountains turn green, you’ll still find plenty of fun. Call Peak 1 Express for a Vail airport shuttle that will get you into this wonderful town and on your way to fun in no time. In Vail you can choose from slope side condos to lodge rooms to bed and breakfasts to mountain vacation rental homes. Locals’ Tip: Try Vail on Sale for some of the best last-minute lodging deals in Vail! There’s no shortage of dining options in Vail, CO. Enjoy classic Rocky Mountain cuisine, simple American fare, unique international options, and more. Fuel up with a quick bite before hitting the slopes, or relax and slowly savor world-class menus from renowned chefs. There are so many restaurants with different styles and flavors that you can sample something new for every meal. Ask your friendly Peak 1 Express driver for inside tips on the best local eats. Check out Vail airport shuttle rates, Lodging options and activities in the mountains. Enjoy your cold months or warm months in the beautiful Vail Valley! Add the following events to your list while you visit. Turkey Trot: The morning of Thanksgiving, take part in this 5K race before indulging in your turkey feast. Holiday Lantern Walk: This parade is part of the Vail Holidays line up, which goes on for nearly the whole month of November. The kids will love the light show! Vail Snow Daze: Kick off your winter season with free live music and family friend activities. Skadi Vail Women’s Ski & Board Festival: Women all come together for a weekend on the mountain with some experts and great perks. Burton U.S. Open: Debatably the most well-known event that happens in Vail every year. See some of the most popular Olympic snowboarders doing what they love on the slopes. Vail Summer Bluegrass Series: For a couple Wednesday evenings in June and July, get a chance to see some incredible live bluegrass music at the Arrabelle at Vail Square. Gourmet on the Gore: Presented by Audi, this event is held every Labor Day weekend and takes over the center of town. Try some incredible cuisine paired with alcoholic beverages for these few days in Vail. FIPS Mouche World Fly Fishing Championship: View some of the best of the best fishing right in the valley and jot down a few tricks for the next time you’re out in your waders! Vail, Colorado offers a wide array of invigorating activities during both the summer and winter seasons. Having so many options means visitors get a chance to do whatever they’re in the mood for about what to do while in the area. The Rocky Mountains are the greatest playground. Take advantage of all of the activities Vail offers. You’re probably planning your Vail airport shuttle so that you can ski and snowboard, but don’t let yourself be limited! No matter how great the snow is while you’re in town, you won’t want to miss out on all of the other fun activities to be had in and around town. Set in the White River National Forest, Vail is one of the most renowned ski resorts in the world. Sitting right above 8,000 feet in elevation, Vail’s town was built to compliment the ski resort. At just over 50 years old, Vail is now the largest ski resort in Colorado. Vail attracts plenty of visitors in the summer as well with great mountain biking and the vibe of a small mountain getaway. Plenty of opportunities for great outdoor activity surround the area. Gore Creek runs through the center of town and is a common destination for fishermen from all over in the summer. During the “mud seasons” in spring and fall, Vail turns nearly into a ghost town. Missing out on this time of year would be a mistake, as the aspens in the fall evolve into a blanket of yellow and the crisp mornings in the spring are perfect for hiking and fishing. You may even catch one last snow in March or April, since Colorado’s weather can be so unpredictable.